This is the 2015 edition according to the label on the can. 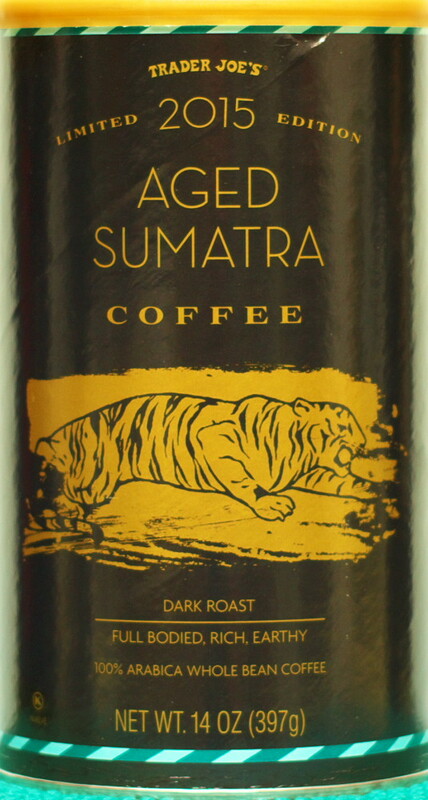 The label speaks to the special aging process the coffee goes through. The beans are aged for two years before roasted and sold. By placing a “vintage” on the can, perhaps this is a new trend in how coffee beans are being differentiated in a similar fashion as wine. However, the aging process is different between wine and coffee. Wine is a freshly processed agricultural product. The finished product, wine, is stored and aged. The grapes are not aged. Coffee beans on the other hand are a raw agricultural product subject to spoilage in several different ways. Most current thoughts are along the lines that coffee beans should be processed, roasted and used as soon as possible after harvesting the beans. 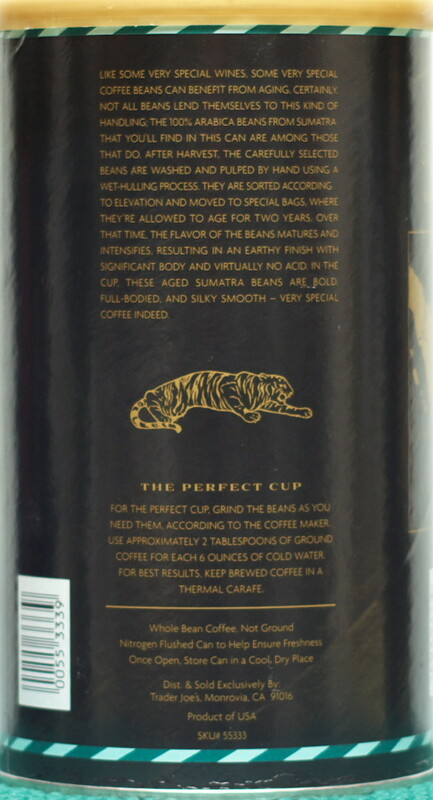 For your inspection, the back label is included below so you may read the story as Trader Joe tells it. First taste is quite bitter. That overwhelms any other tastes in the cup. Other than the bitterness, which is going to be a personal choice, there is nothing bad tasting in the cup. The bitterness lingers even after the coffee has left the mouth. The bitter taste sort of coats the whole roof of the mouth and tongue. One might say the taste goes a long way. While bitter, the coffee is about as smooth as a bitter coffee can be. The throat does not feel like it’s being slowly dissolved by acid. That’s a good thing for most of us. This coffee is very palatable black, if you like a bitter coffee. There is no need to reach for the half-and-half or sugar or who knows what to avoid using the coffee as landfill. Over several days and several cups of coffee, the bitterness seemed to diminish. That’s probably due more to the mouth getting used to the coffee than any change in the beans once the can was opened. And as always, a little shot of Irish Cream took the edge off completely – in more than one way. Trader Joe’s “Flyer” advertised the coffee giving the impression this is a limited availability item. In fact, the impression is left that this is the first and possibly the last time this coffee will be available. If you don’t find it on the coffee shelves at your local TJ, you may have to wait until it’s available again. If you don’t see it, ask the friendly TJ crew. Whether the “aged” beans are a marketing gimmick or a new trend in how coffee is processed, the process used for these beans doesn’t add any negatives to the cup. Whether the bitterness is produced from the aging process or is just a characteristic of these beans and the way they’ve been roasted is to be determined. For people who like a dark strong cup of coffee similar to some northwest coffee roasters, this is a better cup of coffee. If you’re not a fan of dark roasts, pass this one up. This entry was posted on 12/16/2015 at 14:03 and is filed under food, Recipes, food, cooking and related items, Trader Joe's. You can follow any responses to this entry through the RSS 2.0 feed. You can leave a response, or trackback from your own site.